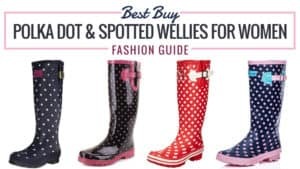 Wellington boots are probably the most used form of footwear in the United Kingdom. 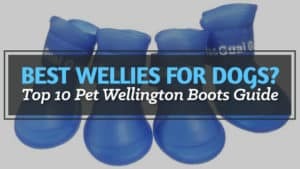 With rain as the most common weather type, the Wellington boot keeps feet dry and warm when walking the dogs or working the farm. 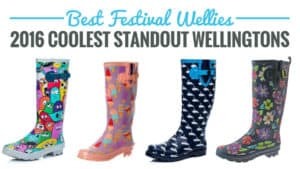 Whether you are a festival goer or a farmer, a sturdy and reliable pair of wellies should be your number one shoe. 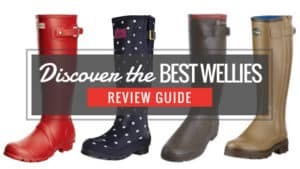 In this ultimate guide that follows, we help you to find the best woman's wellies ​on the market, along with what you should be looking for when purchasing the best ﻿wellingtons. 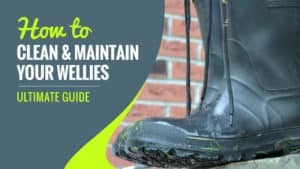 In the search for a good and reliable pair of wellies, you will want to find something that is hardwearing, long-lasting, and unlikely to leak. A boot that will fit your leg comfortably and keep toes warm during unforgiving winters is often an added bonus. 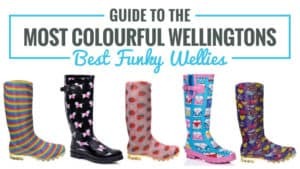 A good welly will preferably work all year ‘round so that you won’t need to change them seasonally because one gets too warm in the summer. 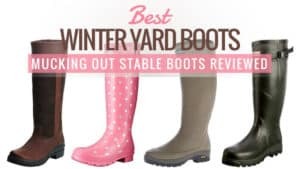 In this article, we will be looking at ladies wellies and looking at which ones are the best to buy. 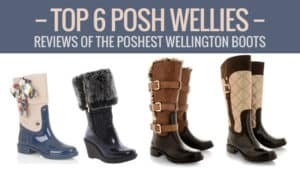 Whether you are looking for something cheap and cheerful, or something a little higher end, there is sure to be a Wellington boot for you. This French brand of welly boot is one that you will want to keep an eye on. With some of the strongest and most stylish boots in the world, you really can’t go wrong with a pair of Aigle boots. Take a look at the reviews below to see if these are the right ones for you. 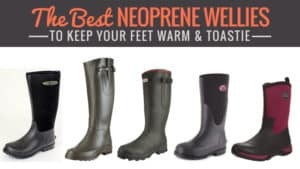 These wellies feature an excellent neoprene lining, which is perfect for keeping your feet warm on cold days. The best form of insulation, you are unlikely to end up with chilly toes. The sole is thick and has excellent grip, as well as shock absorbency for added stability and comfort. It has an adjustable gusset that is waterproof, like the rest of the boot, so rainy weather doesn’t need to stop you from getting outside. The boot fits snugly, but comfortably, to your leg, and the fitted ankles ensure that your feet are held in place at all times. Handmade in France, they are excellent quality. The ankles can be very narrow for those who do not have tiny ones. The neoprene lining also seems to have a habit of pulling socks down for some customers. These boots from Aigle come at a very reasonable price, and are suitable for both men and women – although more so the latter due to the small ankle area. While there have been a couple of issues with the boots in the views of some customers, the majority find that these are some of the best boots they have bought. A great option at a good price. Q: Are these the parcours 2 iso vario? Do they definitely have the adjustable buckle on the side? A: These are the Parcours 2 iso; they have the adjustable buckle on the side and are neoprene lined. The Parcours 2 Vario is the same boot but has a cotton lining instead of neoprene. Joules are a fantastic and popular brand. Their wellies come in a range of styles and prints, giving you something a little different to enjoy while you are working or walking. If you think this could be something for you, take a look at the reviews below. 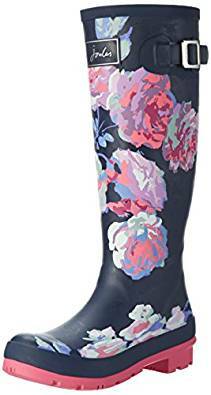 These wellies feature a gorgeous (and different) floral design that is sure to leave you the envy of your dog walking field or place of work. However, if floral isn’t your thing, there are a range of other patterns including horses and stripes. Made for yard work you know that these boots are going to be able to take the pressure. They have a gum rubber sole that provides a strong and natural grip that will keep you steady in just about any weather. They also slide on and off your feet with ease, so you won’t end up struggling to get them on or off each day. The textile lining adds a little extra warmth and comfort, which is great for chilly weather. They can be a little big when ordered, so some recommend ordering a size down from what you are. A couple of customers also noted that they were a little tight on their calves, and that the buckle is just for aesthetics. Joules is a trusted brand that has a lot of experience when it comes to making good quality boots. Available at a low price, they can slot into just about any budget, and they also come in a range of great and stylish designs that are sure to leave you impressed. Despite a couple of niggles, these boots still prove themselves to be one of the most popular on the market. Q: What is the circumference of the top of the boot? A: It’s approximately 16”, but with an adjustable strap which can give roughly an inch each way. 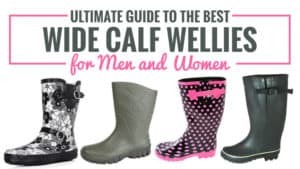 Q: Are these wellies adjustable at the calves?? They look like they are but not sure. 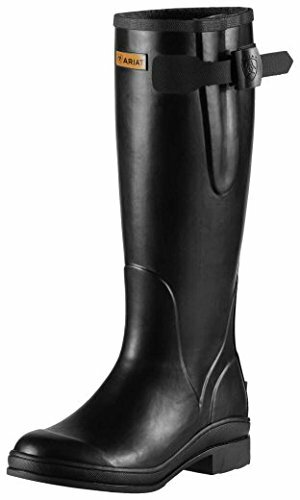 Another model from Joules, these boots are designed for those who like to work with horses or own them. As an equestrian brand, they understand what you need, and this is reflected in every boot that they make. Take a look and see if these are the perfect fit for you. These navy wellies offer a slim but comfortable fit that won’t rub against your leg, and will instead provide it with the comfort it needs to get through a long walk or a day of work. They have a textile lining for a little added comfort, as well as warmth during the chillier months. The gum rubber sole provides excellent grip and tread, which is perfect for slippery conditions as well as yard work. 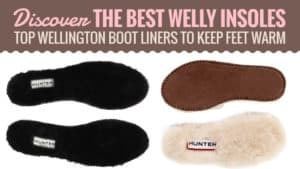 They are easy to slide on and off your feet as well, which makes them ideal for those who don’t want too much hassle when it comes to getting ready to go out or when coming home. There have been a couple of occasions where the boot has split around the ankle and down the seams. However, this is uncommon. These reasonably priced boots are great for those who want good quality without a massive price tag. Made for those who work in the yard and with horses, they can withstand long shifts and days of work if you take care of them. While there have been a couple of issues, these are very uncommon, and the majority of people agree that these are a brilliant investment. Another model from top brand Aigle, these are the perfect addition to any outdoor wardrobe. With a sleek and stylish look, you can work in comfort with a pair of these. 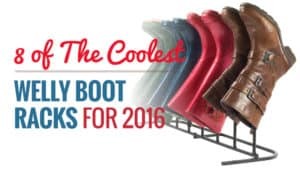 Take a look and see if they are the right boots for you. These wellies are incredibly comfortable, and feature a soft faux fur lining to keep your feet nice and warm during the cold winter months. Wonderfully insulated, your legs will also benefit from this cosy lining. Designed to slip on and off easily, they take all the hassle away when it comes to going out and coming home in it. The soles are thick and made from natural rubber, improving your grip and tread when on unforgiving terrain. 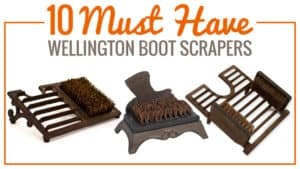 With a self-cleaning tread, you will find your boots don’t get packed with mud very easily. Made from rubber, these boots are waterproof and handmade in France. Plus, they fit your leg closely and comfortably. Some have found these boots to be a little baggy at the ankles, which leaves their feet loose in the boot. Others have noted that they do feel a little shorter than most other wellies. Reasonably priced, these boots from Aigle are excellent quality and sure to leave your feet feeling wonderfully warm and protected. While there have been a few issues with the size and fit of the boot, this is very uncommon and not something that most people have experienced. If you choose these, you know you are getting the best quality. 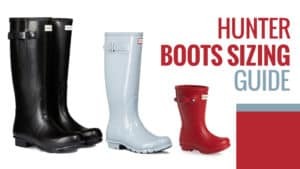 Hunters are the best-known make of Wellington boot for ladies, and the brand has become exceedingly popular in Britain. 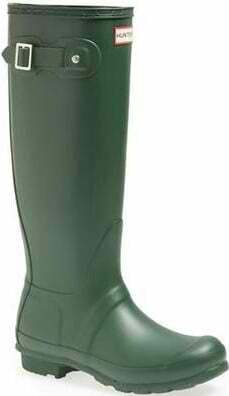 The Original is probably the most widely used model of Hunter wellies and comes in three fantastic colours, with the olive green being the most popular. The Original is a tall boot that is made from 100% rubber and contains a synthetic fur lining for warmth and comfort. Handcrafted from several different pieces, these boots are made with the care that the Hunter brand holds so close to their company values. Made for style and practicality, these boots are priced at around £85. 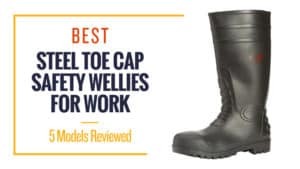 While they may be a little higher on the price scale, these boots are worn by hundreds across the country, and the reviews for this ladies Wellington boot says it all. The Original Hunter for women is lightweight and reliable, making it perfect for long walks with the dog or just doing jobs around the farm. It has a stylish look and a comfortable fit that makes it perfect for showing off, and ideal for the festival season. The synthetic fur helps keep your toes warm in icy weather as well as adding to the comfortability of the wellies. The soles have excellent tread and are made of good, thick rubber for extra grip. These full-length boots are great for everyday use. However, if you are looking for a boot that really lasts under heavy working conditions on the farm or at the stables, it’s worth looking in the Balmoral range at Hunter (priced at around £130). This is because there have been a few occurrences where the Originals have torn and leaked after a few months of use. They can also be quite tight around the feet and ankles, and there isn’t very much ankle support in the boot. This can make it a little difficult to take them off and get them on. In general, Hunter Originals are a practical boot for general walking and festival going. While they are at the higher end of the price spectrum, they are generally seen as a reliable brand despite questions about their quality. If you are looking for a boot that you can use for things like farm work and extensive use, then this is probably not the boot for you. Hunter is a trusted brand that is worn by hundreds every day. From general walks and light work, to showing off your style at festivals, these boots are excellent and practical for everyday use. Despite questions about their quality, they are still highly regarded – which says something about them as a brand. If you are looking for a good all-rounder, then the Hunter Originals for ladies are just the wellies for you. 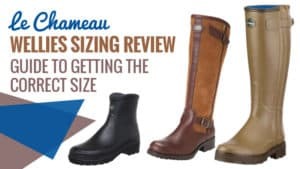 Ariat is a brand that is well-known, and well-loved by many in the equestrian community. Offering style and practicality, it’s easy to see why they are so popular. The Mudbuster model is particularly useful for the equestrian woman, because you never know when you have to jump in the saddle. Priced at around £84.99, these boots may be a little higher in price, but they are worth it for their multiuse function. From mucking out and general stable work, to hopping in the saddle, these boots will let you do it all – and in style. These comfy wellies for ladies are just what you need for you or the equestrian rider in your life. These women’s wellies are made from vulcanised rubber and have a moisture wicked lining for increased protection against wet weather. The duratread outsole is made for a non-slip experience by giving you extra grip. These durable wellies are just what you need for a day at the yard. With a riding heel at the back, these wellies are made for use both in and out of the saddle, making the transition from work to riding easier than it has ever been. With an adjustable strap, comfort is maximised around your calves, and these lined wellies are sure to keep your feet warm too. The Mudbuster’s are good for general use at the stables, but there have been a few occasions where they have split and torn, allowing for leaks. They can also be quite heavy to wear, especially if you are used to a lighter boot. It is recommended that these are worn for light use and work. The Ariat Mudbuster is ideal for equestrian life as they allow for a quick change from work to riding while offering excellent comfort throughout both experiences. Despite instances where they have torn and split, the Mudbuester’s are great for general use and light work around the stable yard. Don’t dismiss these wonderful women’s wellies; they are practical and comfortable for equestrian riders everywhere. Best for: Equestrian work and riding. Chatham is a brand that is mostly associated with sailing shoes and apparel. 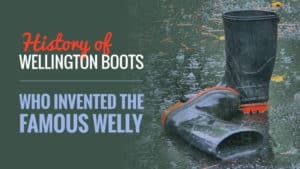 Their yacht shoes have received a lot of praise in recent years, and now that they have released their welly boot range the same quality is expected. Priced at around £49, the Chatham Tamar wellies for women seem to do just that. These funky wellies for women feature a knot design on the boot that is reminiscent of the brand’s sailing roots. 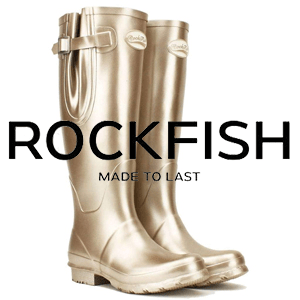 Waterproof, and made from rubber, these boots appear to encapsulate style and practicality in one affordable package. These boots are high-legged for extra protection from the rain and damp. They offer a good sole made from thick rubber for extra grip and a superb tread. While the buckle on the side is merely decorative, it’s not needed for these easy to put on boots. They are incredibly easy to slide on and off the foot without any faffing about with stuck feet. These stylish wellies are great for general use and taking the dogs out on long walks. They hold the same quality that the Chatham name is known for and have certainly done the brand proud. Despite their great practicality, these boots are not seen as the most comfortable. While the fit is good, there have been a few instances where walking for prolonged amounts of time in the Chatham Tamar’s caused irritation in people’s feet. They are also not particularly warm, and socks are advised. 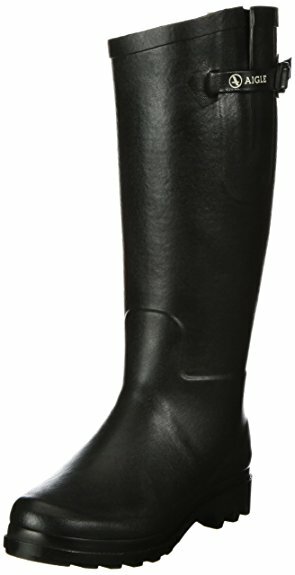 The Chatham Tamar is perfect for festivals, as this funky welly for women shows off a great design. 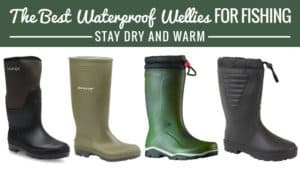 So if you’re looking to keep your feet dry and muck free while out in muddy festival fields (or even in your own) then these are definitely going to serve you well. 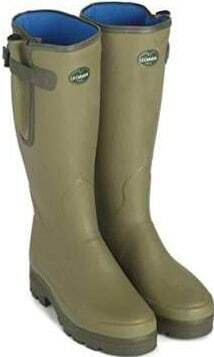 Their excellent quality and durable nature mean that you won’t be replacing these super wellies anytime soon. Best for: General use and festivals. 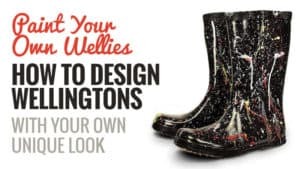 When it comes to cheap Wellington boots for ladies, then Dunlop is the brand for you. Dunlop has always maintained a passion for affordability without skimping out on the quality of the boot. Many who buy Dunlop brand boots have found that they have lasted for years. The Dunlop Standard boot is priced at around £10. Made from flexible rubber, this boot is cheap and practical while protecting your feet from the harsh conditions outside. The Standard Dunlop comes in classic green, and while it may not be the fanciest looking boot on the market, it certainly does the job. These comfy wellies for ladies aren’t going to cost you the earth. They are durable, long-lasting, and ready to take on extensive use and activities. They are comfortable and warm, with an excellent for those with a slightly wider calf. 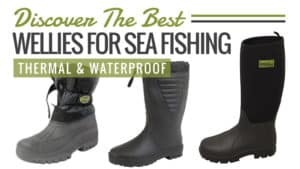 These waterproof wellies are good at protecting you from the cold and the wet in winter, as well as keeping your feet cool in the spring and summer. These boots will work for you all year round and are ideal for farm work and dog walking. The Standard boots from Dunlop do have floppy tops. These can make putting them on a little tricky as they fall over on one side. But as long as you don’t mind being patient this should not cause too much hassle. There have been a few instances where the boots have split and leaked, but this has not occurred often. The soles are generally good, but the tread is not great so they are not completely non-slip. 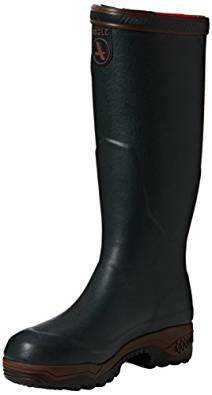 These cheap ladies Wellington boots are comfortable and offer great practicality in ever day life. They are durable and long-lasting, while being able to keep up with your daily activities. 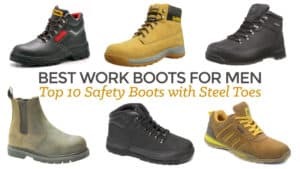 Whether you are using them in rain, shine, or mud, these boots will keep you protected and allow you to get on with your tasks. 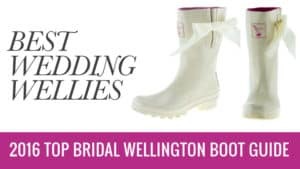 Whether you are wearing them to walk the dogs, work, or even festivals, these ladies cheap wellies are sure to last you quite some time. Best For: cheapest price, walking, farm work. Joules are a well-known brand throughout the United Kingdom. Specialising in equestrian wear, Joules have gained quite a large following over the years. With funky designs for their clothing and boots, it’s hard to beat them in terms of style and practicality as a combination. 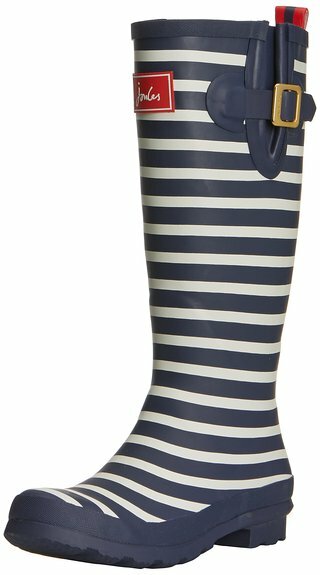 With prices at around £69.99, the Joules Printed Wellies are funky and practical. Made from rubber, these wellies tend to be durable and reliable for everyday use. 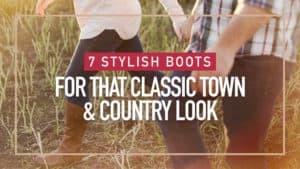 So whether you are walking the dogs or going off to festivals, these boots might just be right for you. 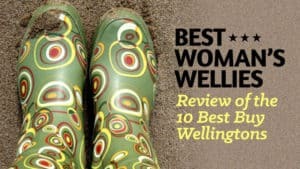 Even the reviews of these ladies wellies suggest they are one of the best to buy. These full-length wellies offer incredible comfort while keeping your feet lovely and warm on cold days. 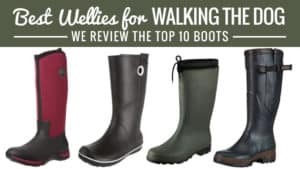 These boots are ideal for long walks and general use, and with a hardwearing sole that has superb tread, you are less likely to slip over in wet and muddy conditions. 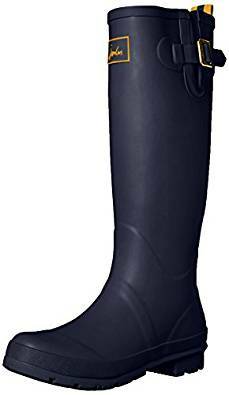 The adjustable buckle on the side of these wellies for ladies means that your feet will be lovely and secure in these, and they fit well on those with wider calves. Joules boots are not made from multiple pieces of rubber; they are made from just one, which really improves their strength and durability. Flexible while walking, these easy to slip on boots have everything you need to make the most of your walk. There is only one downside to these boots, and it’s that there have been a few occasions where the boot has split or torn after a few months of use. However, this is down to personal use. 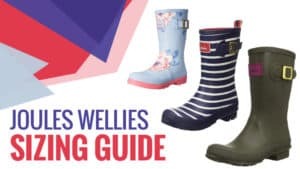 Joules is probably one of the best value for money wellies out there, and with a one year guarantee on these boots, you can really feel their confidence in the product. Ideal for a range of activities, these funky ladies wellies are sure to turn heads as well as provide you with a practical everyday welly. So whether you plan to go to a festival or walk the dogs, it is worth considering these reasonably priced boots. Best for: Festivals and general use. A style frequently copied in appearance, but never in quality, Dubarry are a brand fast growing in popularity. Hailing from Ireland, these fantastic leather wellies for ladies simply scream style and comfort. With every boot made from breathable and waterproof leather, one you go Dubarry you never go back. 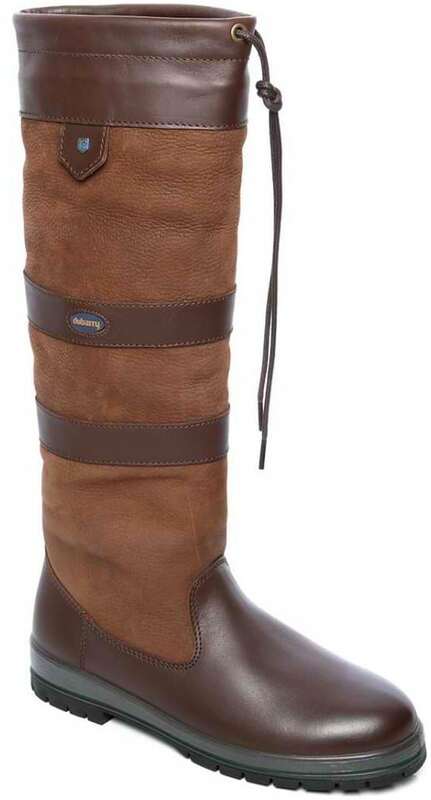 The Dubarry Galway boots are on the high end of the price spectrum, with prices around £299. However, they are well worth it and offer excellent value for money as they are not only durable but are certain to last you a long time. With most wellies you need to buy a size up or down from what you actually are, but with the Dubarry Galway boots you don’t need to worry about that. Made to fit, these boots offer comfort in leather, while still keeping your feet warm and dry thanks to the DryFast-DrySoft leather that they are made with. It’s a durable boot that is unlikely to split or leak, and the soles have fantastic grip thanks to the compound PU and rubber that is used to make them. With improved tread, it’s unlikely that you will slip and fall, making these boots ideal for everything from farm work to general use. With knee high leather ties, you can make sure that your boots are at a tightness that is right for you. They come in three calf sizes so that you can get the one that is going to be most comfortable for you. 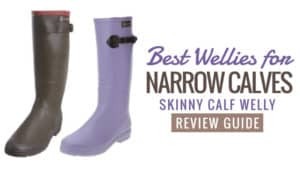 You don’t need to go for low quality to find something to fit your calf with these amazing wellies. The Dubarry Galway’s are ideal for every occasion as their smart appearance means that you can wear them to more than just the farm - many wear them to smart casual gatherings and they still look amazing. Unfortunately, these wellies are not in everyone’s price range as they are a little more expensive than most. The leather requires regular upkeep to prevent it from getting out of shape and having the appearance of cracked earth at the top. However, Dubarry supply and excellent and incredibly affordable range of kits and creams so that you can care for your boots. These ladies leather wellies are exceedingly comfortable, and come in several sized to fit thin and wide calves. They are durable and long-lasting, and so while they may be a little more expensive it is worth it for the level of reliability that they offer. The Dubarry Galway leather boots are certainly the way to go if you are looking for something practical, durable, and wearable for all occasions. They really are the best value for money. General use, farm work, festivals, dog walking. Town and Country have been in business for over half a century and are seen as one of the leading gardening product suppliers in Britain. They pride themselves on their high quality and affordability – with Town and Country cheap and cheerful has never been such good quality. 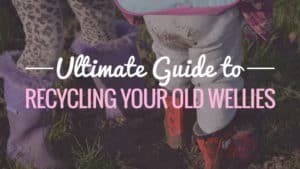 If you’re looking for cheap wellies for ladies, then these are the ones for you. 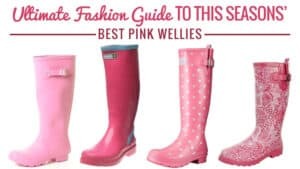 The Limited Edition Pink Spotty wellies from Town and Country are simply fantastic and priced at around £7.99, making them one of the cheapest ladies wellies on the market. These excellent and durable wellies are sure to last you quite some time while offering you a funky style. These traditional length waterproof wellies provide you with great comfort on your daily walks or even during muddy festivals. They are very cheap and so fit into anyone’s price range, making them the ideal buy. 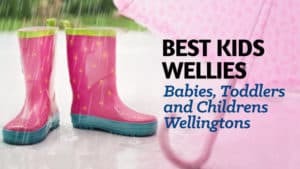 The seams on the welly are reinforced to protect them from tears and leaks. They have a reinforced steel shank for added support and are an excellent fit on most legs. 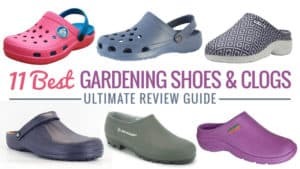 They are good to use all year round and don’t let your feet get hot in the summer. 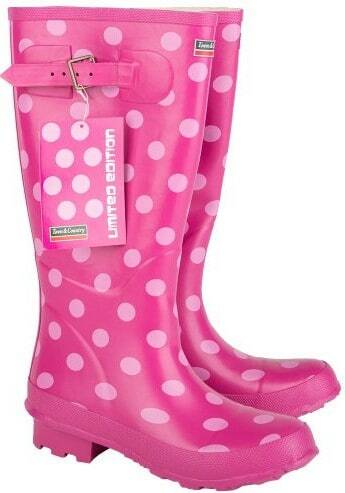 With a stylish design, these women’s wellies are a must have for your walking and festival needs. Durable and long-lasting, there is no need to be concerned about having to replace them quickly. The only potential con for these boots is that they are not insulated and so are not great at keeping your feet warm in cold weather. However, wearing a thick pair of socks is sure to do the trick! Town and Country practice excellent quality products at affordable prices. Whether you are looking to walk the dogs or show off these stylish wellies at the next festival, these boots are sure to last you through it all. 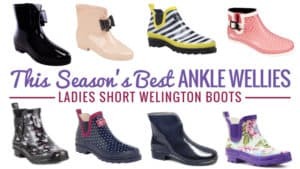 Durable and comfortable, they have everything that you could want from a cheap and fun Wellington boot. Best for: Festivals and walking. Le Chameau is a brand that is only growing in popularity and recognition. These high-end wellies offer an incredibly comfortable fit while accommodating those with wider calves. The Vierzonord is made with a neoprene lining to keep your feet warm when it’s cold out without leaving them to swelter in the summer months. With prices around £164.95, they are certainly on the high end of the pricing scale but they are more than certainly worth it. These are one of the best women’s wellies to buy, as they are durable, comfortable, and sure to last you for many years to come. 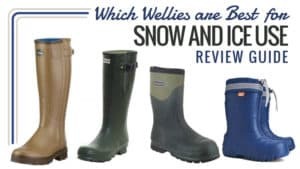 Just look at the reviews for these fantastic wellies. 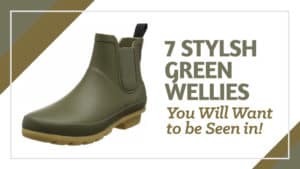 These high and straight wellies offer a supportive fit for the ankle and the instep, something that is not frequently seen in Wellington Boots. With a waterproof gusset and a neoprene lining, the Vierzonord boots have everything you could possibly need to keep your feet warm and dry in harsh weather. With a tightening strap and sizes that allow for wide-fit calves, these boots are practical and idea for everyone. The sole is known as a cross sole, and is bi-density for abrasion resistance. Made to be worn practically, these boots have an excellent tread so that you won’t end up with a muddy back and soaked through in slippery conditions. A two year guarantee shows that Le Chameau Chasseur is confident in their product. These boots are more expensive than most other brands and models, which can be disappointing for some. 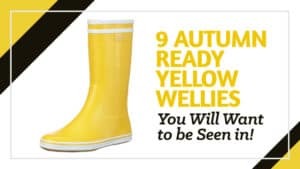 Other than that, there are no downsides to this Wellington boot. These wellies are practical, stylish, and durable -everything you need in a boot. 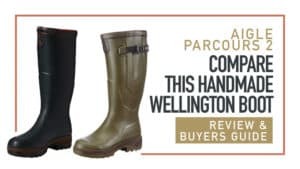 With a two year guarantee, and incredible comfort you are sure to have an amazing experience with these fantastic wellies for women. These aren’t just going to last you a few months, these are going to keep going for years, so even if they are a little more expensive than most, you know you got your money’s worth. Made in France, Aigle offers sophistication balanced with practicality at good prices. The Miss Marion Boot is priced at around £105, but offers excellent durability and can be used for a range of activities. Whether you want them for farming or festivals, the Miss Marion Wellington boot for women is there to meet your every need. The Miss Marion is waterproof and comfortable, while also offering you a great deal of warmth with its soft inner lining. Handmade in France, the Aigle boot was created for the working woman so that she could work her farm in comfort without losing her style. Durable and lightweight, these boots will allow you to get on with your work without giving you sore feet. 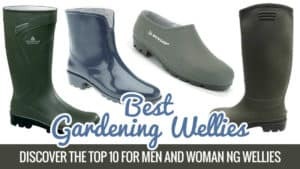 These wellies can be used for general walking and garden use as well. The fitted calf provides you with comfort during your daily activities. So whether you are buying these boots for work or pleasure, these foldable ladies wellies were made to last. If you are looking for a standard height boot for work, then this is not the one for you. As a result of the height of the Faconnay, it can rub against the calf a little but this depends on the individual wearing it. The Miss Marion’s fitted calf can be a little tight and so less comfortable than expected. They can also be a little hard to get on and off due to the tight calf fitting and also slightly narrow toe section. Whether you are searching for something to get you through the day working on the farm, or a welly for everyday use, the Miss Marion from Aigle is an excellent boot to go for. 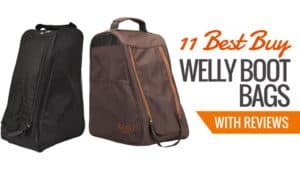 While a little more expensive than others by the brand, they are long-lasting and durable so you don’t have to worry about sudden leaks and tears. With Aigle, you can work all day without the fear of blisters. Best for: Farm work, festivals, and general use. Aigle is a French brand that brings style and durability to their wellies. 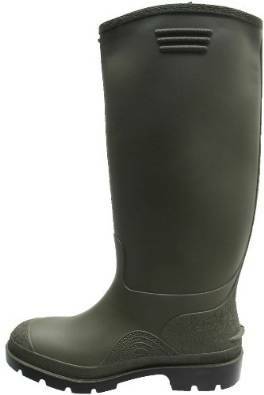 The Chanteboot is a fantastic ladies ankle Wellington boot that is often used for shooting. With prices starting at around £80, they are reasonably priced without cheating on quality. Built with a strong sole and with the boot itself handmade, these sturdy wellies will last you a long time if you treat them well. 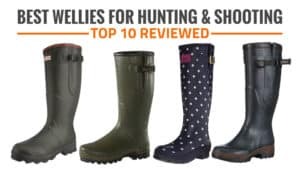 The reviews for these show that these are some of the best ladies wellies you can buy. The Chanteboot is perfect for the shooting woman. These women’s ankle boots provide flexibility while walking as well as protection from the wet and mud. They are lightweight to walk in, and the sole provides a good grip and excellent tread, so slipping over is a lot less likely. In addition to making great shooting footwear, they are also practical for farm work and everyday use. They are durable and long-lasting, so the Aigle Chanteboot will last you for quite some time. At a reasonable price, these boots will fit in nicely with you. The Chanteboot is, however, a little on the large side. The boots can be a bit roomy so it is definitely worth trying them on before you buy to make sure you have the right size. It is advised that they are worn with thick socks to keep your feet warm and also to take up any space that may be left over. However, unlike most wellies, these won’t pull your socks down while you walk! 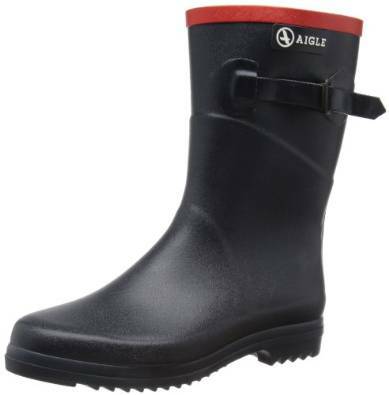 Aigle are producers of fantastic Wellington boots and they always keep practicality in mind. 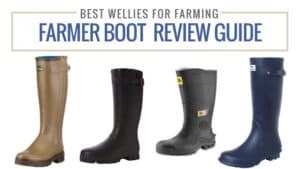 If you’re looking for a pair of wellies for farm work, then these are probably one of the best buys you can make as they will not only last you through the farm work but general use as well. With a solid grip on the soles and excellent comfort these boots will last you a long time and keep your feet working smoothly through long days at work. Best for: Farm work and general use. With these women’s wellies, the best brands to go for seem to be ones such as Le Chameau Chasseur and Aigle. While they are a little more expensive, they offer fantastic comfort and fitting without losing out on quality and durability. A well-made boot is often hard to find, as many are cheaply manufactured, so even if you have to spend a bit more it is often worth it for the fact that they will last you years – saving you money in the long run. However, brands like Dunlop have also proved themselves hardwearing despite their low cost. Boots like these can be used for a variety of purposes and last a long time without costing the earth. 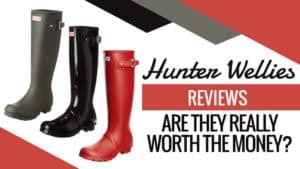 If you’re just looking for a casual Wellington boot for women, or one to wear at festivals, it’s probably more worthwhile taking a look at brands such as Town and Country where the boots are inexpensive but incredibly funky for a fun look. 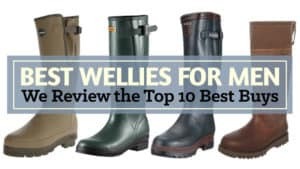 Check out our reviews of the Best Wellies for Men. 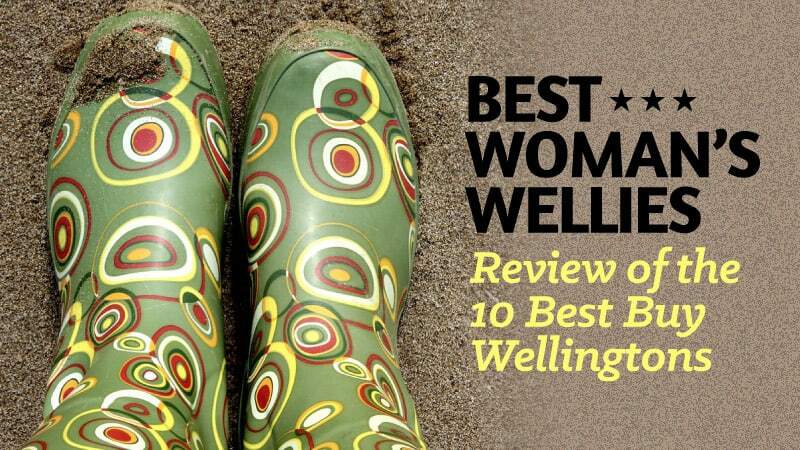 Do you have any suggestions for the best women’s wellies? Do you agree with the list or think some should have been added? We’d love for you to share your thoughts in the comments below!